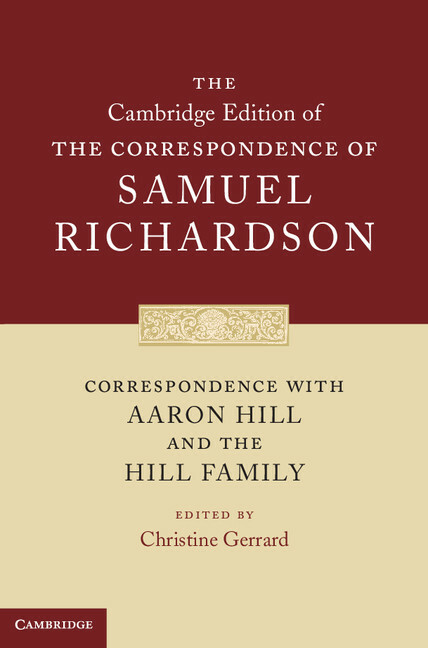 The first volume of The Cambridge Edition of the Correspondence of Samuel Richardson (1689–1761) is now published: Correspondence with Aaron Hill and the Hill Family (December, 2013). There will be twelve volumes in all, which will be published over the next few years. To celebrate the publication of the first volume of this new series Dr Christine Gerrard (Lady Margaret Hall, Oxford University) is organising a launch mini-conference and would welcome contributions on Samuel Richardson and editing eighteenth-century letters more generally. For further information, and to discuss potential contributions, please contact Christine at: christine.gerrard@lmh.ox.ac.uk. Samuel Richardson (1689–1761) was an established master printer when, at the age of 51, he published his first novel, Pamela, and immediately became one of the most influential and admired writers of his time. Not only were all Richardson’s novels written in epistolary form: he was also a prolific letter-writer himself. This volume in the first ever full edition of Richardson’s correspondence includes his letters to and from Aaron Hill, the poet, dramatist and entrepreneur (1685–1750). Hill was Richardson’s earliest literary friend and advisor as he embarked on a new career as a novelist. This correspondence offers fascinating insight into the compositional processes not just of the two Pamela novels, but of Richardson’s later novels Clarissa and The History of Sir Charles Grandison. The volume also contains Richardson’s correspondence with Hill’s three literary daughters, which forms an invaluable chapter in the history of women’s writing and literary criticism. Aside | This entry was posted in Call for Papers, Updates. Bookmark the permalink.